I’ve been using my Camp Chef pellet grill a ton lately, so I thought it was about time to write a review. This review focuses on the SmokePro DLX PG24 model. I use it primarily for smoking, but I’ve also done some grilling here and there. 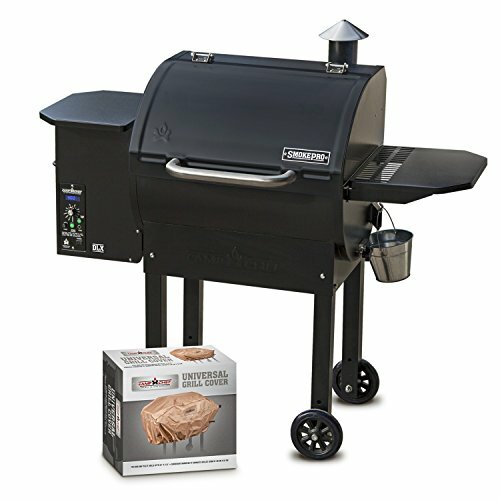 In this review I try to cover everything a potential buyer might want to know about this grill/smoker before purchasing. If I missed any important topics or you have specific questions, please let me know! I remember when I was initially researching pellet grills, Traeger and Camp Chef stood out to me as the top choices. And I should say this first – both companies make great products. However, I went with Camp Chef because their model offers a few extra features. First, and most significant, is the ash cleanout system. With a Traeger, you have to vacuum out the ashes, but with a Camp Chef smoker you simply pull a lever to release the ashes from the fire box. The Camp Chef also comes with a probe for your meat, which plugs into the control panel area. With the press of a button, the digital readout will switch from displaying the chamber temperature to the internal meat temperature. That means you won’t have to bust out your smoker thermometer unless you need to track temps on multiple pieces of meat. Lastly, the squared off back (unlike Traeger’s completely cylindrical design) creates more space for a second cooking rack. Oh, and there’s also a side shelf on the right side, which comparable Traeger models do not have. Short answer: no, but a second person makes it much easier. I remember it taking me about an hour or two to assemble with another person helping me out when necessary. The main thing you’ll have to do is attach various parts to the main chamber, including the legs, side shelf, handle, and chimney. All the complex electrical bits come good to go, so you won’t have to mess with any of that. How's It Work? Is It Easy to Use? 'HIGH' gets the grill as hot as possible (up to 500° F). 'HI SMOKE' and 'LO SMOKE' produce a lot or less smoke, cooking at an average temperature of 225° F.
'FEED' is used when you first fill the hopper with pellets and need to get them going through the auger. The first thing I’ll say about the wood pellets is that they last a surprisingly long time. I was afraid I would feel like I was burning through money, but that’s not the case. I haven’t tried to figure out exactly how many hours you get from a bag of pellets, but I know that I can do several 6-12 hour cooks from one bag. And while Camp Chef recommends that you use their pellets, all the different brands I’ve tried have worked fine. This blend of hickory, cherry, hard maple, and apple has been my go-to for pellets. How Hot Does It Get? Can You Get a Nice Sear? On Camp Chef’s official site, they list the cooking temperature range as 160° to 500° F. On the ‘HIGH’ setting, I’ve gotten my grill pretty darn close to 500° F, but never quite there. I want to say that 478° is the highest temperature I can remember seeing. According to Weber, searing takes place in the 300° to 500° range, and they warn temperatures above 500° can excessively dry out and burn meat. That makes it seem like the Camp Chef’s temperature range is pretty much ideal for searing. However, I will admit it doesn’t feel as hot as cooking on a smoking hot cast iron or grilling over super hot hardwood lump charcoal. I’m sure some folks will want higher temps, especially if you’re trying to get a quick sear on a thin flank steak or something similar. Note that Camp Chef acknowledges this, offering a sear box attachment that is compatible with the SmokePro PG24 (and other models). This attachment is essentially a small gas grill that relies on propane. How Well Does It Maintain Its Temperature? I’ve found that it does a great job of maintaining a temperature. The vast majority of the time it is within 10-15 degrees of the set temperature. It definitely seems to have a little bit more trouble maintaining a temperature in cold and/or windy weather, but luckily most of us aren’t out grilling and smoking when the weather is bad. To be honest regarding the temperature – it’s just not something I worry about now. The first handful of times I was smoking something, I was constantly checking the temperature. It would bother me if it dropped 12 degrees below my set temperature for a minute or two. Now I’ve realized it’s not a big deal and the temperatures average out over hours. Also, everything I’ve smoked has turned out wonderful, so there’s really no reason to be concerned. How Large Is It? How Much Food Can You Fit? The Camp Chef SmokePro DLX PG24 offers a ton of space for food. In the above photo you can see a single rack of baby back ribs, and there’s easily room for a few more. Unless you’re cooking for 25+ people, you’re not going to run into any problems with space. In the above picture you can also see that the top of the chamber has a rectangular back instead of being perfectly cylindrical all the way around. That creates some extra space above the main grill rack, and the second higher rack takes advantage of that space. Is It Really Heavy and Hard to Move? At over 100 pounds, it’s definitely heavy. However, it comes with some high quality rubber wheels, as you can see in the photo below. These make it pretty easy to move around, even over cracks. I honestly don’t move mine around too much. I bought the bundle version that comes with the cover, so I just keep it covered when I’m not using it. The cover does a great job of protecting it from rain. What Are the Cons? Is There Anything You Hate About It? As I mentioned above, in my experience the ‘HIGH’ setting has gotten the temperature up in the 470° – 480° F range. You can still get a decent sear at this temperature, but if you like cooking at the absolute hottest-of-hot temps, then I would advise you to check out Camp Chef’s sear box attachment – or just use an old-fashioned charcoal grill when you really want super high heat. In other words, this model excels as a smoker more than a high-heat grill. Also mentioned above, pellets create a more mild smokey flavor, which is something I actually prefer. However, if you’re looking for a super deep, smokey flavor and an extra dark and thick bark, something like an offset smoker might be better for you. I’ve been extremely happy with my Camp Chef pellet grill. It’s so nice to just set a temperature and let it do its thing, rather than worrying about monitoring a fire. It does a great job of controlling the temperature, and heat is distributed evenly throughout the chamber. It can hold a ton of food, and the ash cleanout system makes cleanup easy. Additionally, I’ve had 0 mechanical problems. If you want to compare it to other top models on the market, check out our best pellet smoker roundup. Very nice review, thanks for taking the time to do that.